I’m always frustrated by how hard it is to get beautiful, intense blues and reds to shine through in an electronic image. This monoprint retained a lot of the brush-stroke feel of the original plate, only slightly softened by its trip through the printing press. This is my favorite of the small series of cruciform images I did at the time. It has an intense burst of sunset color with the rich, calm blue floating above it, almost like someone floating on a pool of water. There’s a real sense of peace and spirituality to it that suits the season. 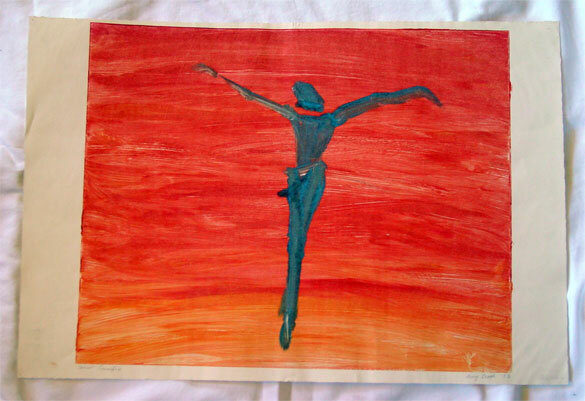 Spirit Crucifix, 18″x14″ monoprint on 22.5″x15″ watercolor paper, $399 with free shipping.